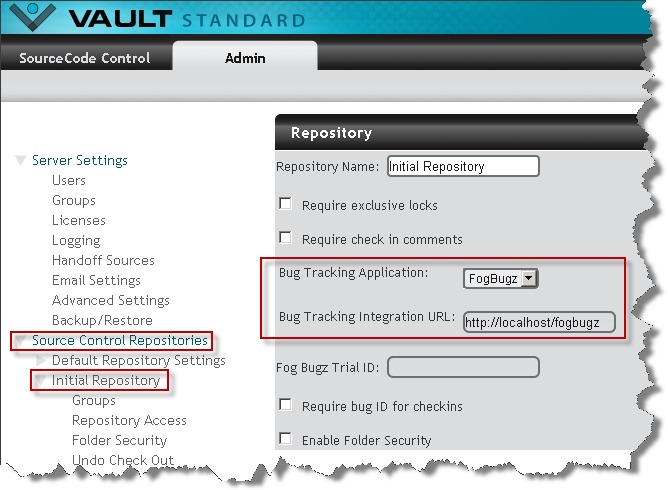 This article describes how to enable bug tracking in SourceGear Vault in FogBugz. Vault <> FogBugz integration is only supported by Vault Standard, not Vault Professional. To enable bug tracking in SourceGear Vault, you must have Vault admin privileges and access to the Vault Admin Tool. Log in to the Vault Admin Tool. Expand Source Control Repositories on the left side. Click on the repository you are setting up. Set the Bug Tracking Application drop-down menu to FogBugz. Navigate to Admin > Source Control. FogBugz will tell you that the repository is created in FogBugz automatically when you first check in code in Vault and set a case number for it. 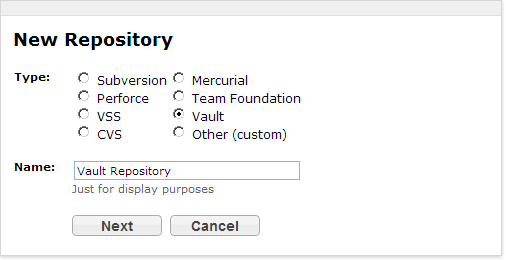 When you commit your first check-in, you will now see the repository in the list in Admin -> Source Control. At this point, you can click to edit that repository and set up the diff and log links. These links show up in FogBugz cases as shown here. The Vault Check-In/Commit dialog allows you to associate a Vault file with a FogBugz case during the check-in process. Type the case number in the Update Bugs edit box.